Data-driven marketing is the strategy of using customer information for optimal and targeted media buying and creative messaging. It is one of the most transformational changes in digital advertising that has every occurred. The rising quality and quantity of marketing data have been followed by explosive growth in the technologies for creative production and automation. These burgeoning mar-tech and ad-tech sectors now enable personalization of every aspect of the marketing experience. Data-driven decision-making is taking the answers to questions like who, when, where, what message, and making those answers actionable. Usage and activation of data, often in an automated or semi-automated manner, allows for a significantly more optimized media and creative strategy. This people-first marketing strategy is more personalized. It has also been responsible for driving considerable ROIs for marketers. The benefits of data-driven marketing and especially data-driven advertising are significant. More efficient media buying. Data-driven marketing is probably the most advanced in the programmatic buying sector. By leveraging algorithms and machine learning, ad agencies and marketers are removing a lot of the guesswork from media planning and buying. Targeting the right consumers. Ad spends and marketing messages are optimized to be shown only to the appropriate targets for the marketing campaign. Messaging audiences with relevant messages. The age of generic, one-size fits all marketing messages is over. There is still room for these big ideas for some brands, but for most companies, marketing messages must get more granular in order to be relevant enough to resonate with consumers. All of these benefits occurring in tandem result in significant ROIs for marketers. Where did data-driven marketing come from and where is it going? Modern data-driven marketing began with the invention of the customer relationship management (CRM) software. CRMs allow marketers to track who individual customers are including the name and contact information. CRMs enable direct mailing, and therefore direct marketing campaigns. Batches of customers may receive different types of messages based on whether the marketer thought the segment was a good fit, and what the customer cares about. The CRM gained new prominence in digital marketing with Salesforce’s innovation to bring it to the cloud. This, in turn, started the age of sales and marketing automation. Digital data-driven marketing came about as the CRM gave birth to a new category, marketing automation software. Example leaders in this space include marketing automation companies like Marketo and Eloqua. They pioneered building individual marketing profiles built on customer interaction tracking on the website and email. This profiling of customers enabled automated emailing based on certain triggers and activities as well as scoring of prospects into segments. Thus began the age of marketing automation. As marketers began segmenting their customers using marketing data, they ran into a new problem around the amount of data on tracked users being accumulated. Customers were now being tracked not only by owned media on marketer websites and emails, but also increasingly in paid media where ads were running—what’s now known as programmatic advertising. Solutions like Krux and Neustar arose to help marketers aggregate the data in a more manageable manner and produce new insights for new targeting and creative plans. Thus began the age of data management platforms. Today, marketers are spending over $6BN a year on data-driven targeting solutions like data management platforms (DMPs) and demand side platforms (DSPs). However, the majority of marketing teams are not yet fully activating their data. They’ve so far been mostly limited to optimizing media with their data. The next stage is activating marketing data through creative and not just media. What does data-driven marketing mean for creative? Before data, creative was produced once with one version for everyone. Traditionally you only needed one final file for an ad. This file was self-contained. It could run on any publisher in that media channel. Designers essentially “produced” a creative file and controlled its rendering. Once the file was passed along, it’s destiny was set in stone. Flashy ad formats like rich media ads were used to get consumer attention. In recent times, some publishers like Facebook have created new formats that require multiple separate assets to be uploaded for the publisher itself to render the final ad. This became known as “publishing” a native ad or creative. The message is a combination of creative assets, presented to the customer in the context of the medium it is running in. Now, with creative, media and data coming together, marketers want to personalize the message based on who is seeing it and where they are seeing it. Intrusive rich media ads are dying, giving way to new trends in more consumer-friendly formats that use message personalization—not intrusion—to gain attention. Social media isn’t the only channel where all of this is possible anymore. With programmatic advertising and marketing automation, nearly every aspect of the customer journey can be personalized. Keep in mind that data-driven advertising doesn’t necessarily require individualized 1:1 messaging, like with someone’s name appearing in the ad. Marketers must be careful to balance the customer experience (creep factor) in the ad or marketing message. Instead, it means knowing what we know about the targeted person—who may belong in larger audience segments of shared characteristics—what would we do differently in the creative. But data-driven marketing does mean creative needs to be personalized based on some of the data attributes of the viewer. This may be a large shift in mindset for some agencies and advertisers. Below are some examples of this marketing strategy. Data is who will see the message and what do we know about the people as far as characteristics and their past interactions. Media is where the message appears, which may also dictate the creative requirements. The process behind dynamic creative, sometimes called programmatic creative, is to set up within a creative platform all combinations of creatives and audience segment data. A single ad unit then uses this data to show the most relevant creative to customers on-the-fly in real time. You can re-use this dynamic creative ad unit in multiple media placements without modification for each media placement. This can save a lot of effort in marketing and ad operations. However, when you spread the same dynamic creative ads around, you lose the benefit of total campaign optimization factoring media and creative together. That’s because dynamic creative ads operate independently of the media system. An analogy would be that you can use a mobile GPS navigation unit by itself on multiple cars, but the GPS may not factor in real-time traffic data. so you can find the shortest distance but may not have the optimized path based on shortest time. You can realistically do this for display, website, and video where you may be in more control of the media and marketing data. With some programmatic creative setups, it’s possible to set up the media platform, creative messaging, and targeting data together. Using this setup, specific creative versions will appear based on the data and the media parameters together—not just the data parameters. To do this, you may have to set up creative multiples times for each media platform you might use. For example, if you use two DSPs, you would upload the creatives two times to two media platforms and then set targeting for the creative twice. That said, you already have to set up media targeting twice so this is just an added step of assigning particular creative to the media targeting so that the media platform can optimize factoring both creative and media together. You have to take this for social media advertising (walled gardens) and email, where a dynamic creative unit cannot read outside data (not from the media publisher) in real-time and therefore cannot independently pick a creative to serve to a particular user. Many companies are seeing tremendous results by activating data in their marketing and advertising campaigns. Here are some examples and case studies of the results you can achieve with data-driven advertising. While these case studies focus primarily on optimized programmatic display ad campaigns, similar results are possible across the data-driven marketing spectrum. 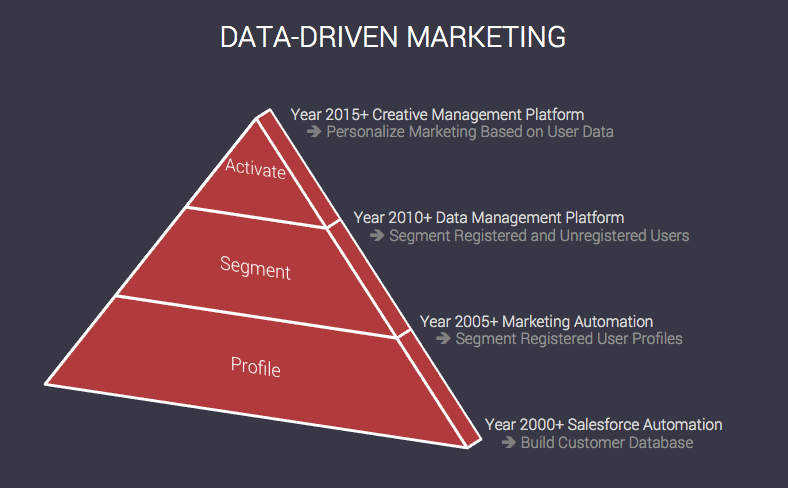 What marketing stack do I need to make data-driven marketing a reality? Every marketing organization has different specific needs and requirements, but they all need solutions around creative, data, and media. Finding the right combination will enable your data-driven digital marketing strategy. No one platform can do everything—even Google and Adobe aren’t succeeding—and even if they sit at the intersection of these main areas. What you ultimately want is a set of solutions that are compatible and a way to bring it all together in a coordinated fashion. Ready to start your journey into data-driven marketing? 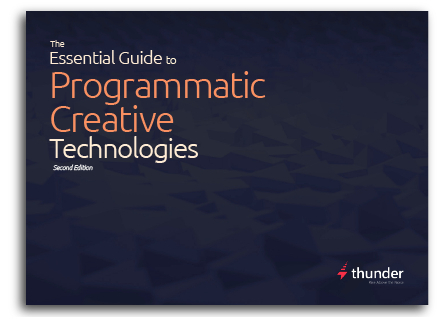 Why not start with programmatic creative? Take the next step. Download our free eBook below.